Many clipboard-enhancing applications take the kitchen sink approach, allowing you to copy and paste multiple files types. 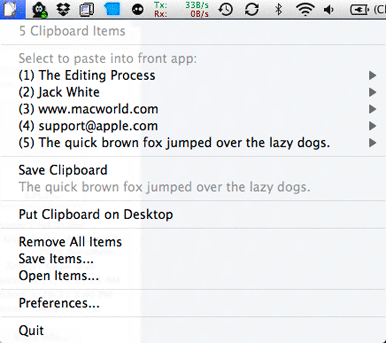 ClipList takes the route of sticking to one thing and doing it as well as it can. ClipList is a simple and straightforward utility that can capture multiple copy or cut commands, and save them in a drop-down list that’s accessible through a menu bar item. ClipList also has other functions that give it added value. It can take the contents of the clipboard and save it to your desktop as a RTF file—much handier than a text clipping file. The other thing it does quite well is save sets of clipboard items that you can load from files previously saved from the menu. At first, I wasn’t sure of the value of the feature. After having used it to paste the same text clippings in to multiple text fields on a web-based database, I easily saw how much time it saved me. Installing ClipList, however, is less than ideal. You have to manually copy both an application and a preference pane. The preference pane is only there for entering the serial number (and it requires System Preferences to quit and re-launch in 32-bit mode). Limit Point Software’s Read Me states the registration will eventually be incorporated in to the application. And, it only does text. Whether that is good or bad is up to your needs to decide. If you need a clipboard expander that does it all, keep looking. If, however, text is all you copy and paste, or if you have sets of text you reuse often in various programs, then ClipList is definitely worth a try.